In 1609 captain Henry Hudson, with his ship "De Halve Maen" (the half moon), sailed up the American river that received his name later on. Working as an explorer for the Dutch East India Company (VOC), he was searching a passage to the Orient. Instead, he found fertile lands that were going to form the colony of New Netherland, with towns like Nieuw Amsterdam (New York), and Beverwijck (Albany). In New York City there's hardly anything left of Dutch 17th century architecture. See also these video clips on a New Amsterdam Tour by best-selling author Russell Shorto, who wrote "The Island at the Center of the World : The Epic Story of Dutch Manhattan and the Forgotten Colony That Shaped America". Fortunately there are plenty of places in Holland that can give you a very good idea what it must have looked like. Also in this region close to Amsterdam, with a couple of small fortified towns surrounded by a varied countryside and lots of water. See pages fortified towns, and cycling for thematic suggestions on day trips. 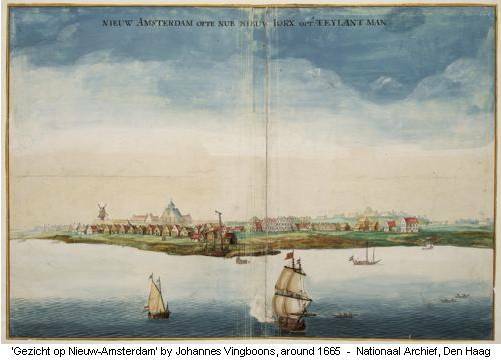 An excellent virtual tour of New Netherland and more links on The New Netherland Project. In Albany NY, the New Netherland Museum; operates the Half Moon, a reproduction of the ship that Henry Hudson sailed from Holland to the New World in 1609. The bestseller by author Russell Shorto The Island at the Center of the World : "A rediscovered trove of historical documents. A new view of American beginnings. An intensely personal power struggle between two men, which would change history. From out of the mists of the past, a forgotten American hero." Dutch Embassy Washington DC also supplies information on US-Dutch topics. NYC 400 : American site with events and exhibits in the USA. Wikipedia on New Netherland and New Amsterdam. www.nationaalarchief.nl : Pictures and maps of Nieuw Amsterdam / New York in the Dutch National Archive.